Giving continuity to the initiative from the last year , TBs is now hosting a new edition from the TechREVERSE Challenge. 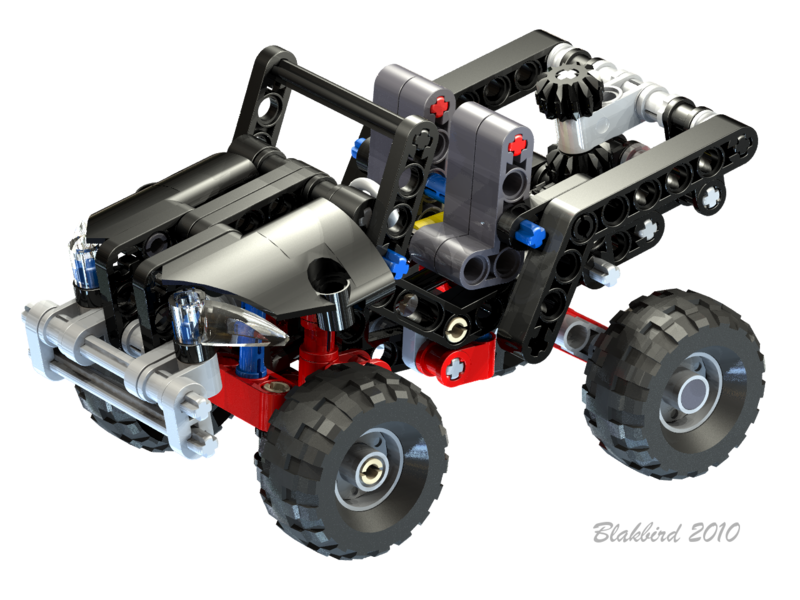 In collaboration with the LEGO Technic product line, we decided to bring one of the 1H2011 models into contest. As you are probably already guessing, the challenge will consist in reverse-build one of the new small models. The model to choose should not include any new element, out of the element assortment available in 2010 (new colors for already existing elements may however apply). So the set selection for the current TechREVERSE Challenge issue is the 8066 (SUV). Reverse and build your own LDraw reproduction from the 8066 main model, based on the product pictures available below. In order to prepare an LDraw model for this set, you may need to install the LDraw Tools if not having them already installed in your system. Even this model not using new parts, you may eventually face the need to use some parts not yet released into the LDraw official library or the latest Parts Update available (please realize I'm not stating you will do). In that case you may want to download the still unofficial LDraw parts. So, in case you miss some required parts in your MLCad installation or similar, we advise you to look for them into the Parts Tracker list (repository of not yet official parts submitted to LDraw Part Library). Additional parts may also be found from a work repository, with parts being shared by the LEGO Universe Team with the LDraw.org community. If for some reason you become convinced that the part you are looking for, is not present into the LDraw official library neither the unofficial LDraw parts, or the work repository above mentioned, then you should skip it and leave the correspondent space empty.. In the eventually of such missing parts, they should not impact the final classifications, as they would affect everyone in the same manner. In case you have difficulties with the LDraw unofficial parts and need further help about this, you may find helpful some of the tutorials published before at TBs [2, 3]. As for every contest, there must be some rules defined, that will help us later to determine who's the winner contestant. Slight changes have occurred when compared to the rules used in 2009. Read carefully! Reverse engineer and reproduce into a LDraw file format, the Challenge proposed model. The reproduction should be exact (model complete assembly, parts color and parts list). Every contestant should submit his participation in the form of one single LDraw file. Hierarchical organization into sub-models is also allowed. The contestants are allowed to enter one single submission (always the first one submitted). Contestants must also include one render image from their model, with a minimum resolution of 800x600. It would be great if you have skills for photo-realistic rendering, but not considered for the purpose of contest evaluation. The winning participation will be the first submission sent, that exactly matches the LEGO official model being reproduced: model complete assembly, parts color and parts list. If none of the submissions fill all the criteria above, it will be selected the first submitted model, that gets closer to the original, based the total number of mismatches counted. All the submissions must be sent to the mailbox above indicated, in the next two weeks. Thus before the 7th of December 2010, 24:00 CET**. Final results are expected to be published by the end of December or begin of next January, depending on the overall participation figures. The Challenge winner will be awarded with one set sponsored by the LEGO Technic product line. There will be also a few extra prizes, for those ending in following rank positions. Due to formalities, the details about the contest prizes won't be communicated immediately, but in the beginning of December. Stay tunned! In the event of any eventual leak with further official details about this model, during the participations submission period, may become a justification to close the submissions period with immediate effect. Any eventual issues not foreseen in the contest rules, shall be evaluated and decided by majority among the TBs editors. **) Use the link provided, to find the correspondent local time at your Time Zone. While planning this TechREVERSE 2nd edition, it came across the possibility to accept files in other formats than those from LDraw (.LDR or .MPD). Namely .LXF files from 'LEGO Digital Designer' (LDD) or .L3B from 'SR 3D Builder'. Despite an idea, this is a relative complex topic, and for obvious reasons I intend to keep the workload generated by this Challenge under affordable limits. Thus avoiding diversity and the use of multiple tools to verify each participant's submission. Because this is a topic not yet analyzed to its full extent, I decided to remain with LDraw, and all submissions will be evaluated with MLCad editor. Nevertheless I'd find very useful if we could have some discussion on the limitations, pros & cons from using other CAD applications and file formats, for the TechREVERSE Challenge purpose. Depending on the conclusions we will reach, maybe we could have a different LEGO CAD tool in use at a future edition of the TechREVERSE Challenge. Availability of all the necessary parts into LDD. File format conversions and cross-tool utilization. Tools capability to generate parts lists. Please remind, my ultimate goal is to use only one single tool to evaluate all the submissions, without loosing any of the information included into the submitted files. Eventually letting the contestants to use the tool of their preference. Despite of LDraw being the format chosen for this edition, if you like it, you may also send the corresponding LDD or SR 3D files, for the purpose of this future evaluation. Feel free to add your thoughts about this subject, as comments to this post. Before submitting the LDraw file from your model to contest, please make sure you have the latest Parts Library Update installed into your system. The latest update is actually release 2010-02. Please also notice that LDraw Library Update files are not cumulative. Thus you must install also those made available since your last update. Alternatively you may also reinstall the Entire Official Library, which should turn things easier and safer. Parts not found when it comes to evaluate the submissions. As a matter of example, sometimes part numbers change from non official IDs into official ones (it was the case from the Bionicle Teeths, formerly x346.dat, now 41669.dat). Parts version update warnings, stating that the file being loaded uses older versions of specific parts. So you can make the model in LDD,and then import it to MLCAD? Or can I make my submission in LDD without using MLCAD and send it to you? I tried to install it before, but I'm not sure if I did something wrong, or if the program just doesn't work on my PC. TBs must receive an LDraw file. It is up to you if you build it with MLCad or LDD and later convert it to LDraw. However in case of any conversion technique you must rest assured that no parts or other information get lost during the translation process. TBs won't make any translation or post-processing to the received files/submissions. Good that I read this, because I just posted photos of the new 8065 en 8066 sets. I've build them and wanted to post building instructions of both sets. I will postpone my action, so I will not influence the challenge. I've seen your photos yesterday online. Searched for them after Junkstyle Gio (Hans) comment to the previous post. Nevertheless as I've explained in my comments there, even if someone publish instructions with his own interpretation, doesn't mean that the contest turns to be unfair. So no one can be sure whether these are correct or not. And may be wasting a good guess in favor of another one, with one single misinterpretation. @Luc2000 it is possible to export an LDD model to LDraw fle format, but the conversion is at present to say the least not very accurate. Part placement is often slightly different and some parts may get lost. Using LDD as a start may work, but only if you then edit in MLCad. Does the ldr file have to include steps? No steps are not mandatory neither a criteria for classification. To all the contestants: Good luck and happy building. What is the ldraw part number for the bionicle tooth? I thought it was x346, but I can't find it in the official or unofficial part libraries. The Bionicle tooth, is among the official parts. You may find it in the parts tree under 'Technic'. Nevertheless you reminded me that I forgot to include in the rules, the hypothetical case where someone believes there is a part not found in the official pats, neither unofficial ones. Then he should simply ignore that part. I'll add this to the main post. This was a significant challenge since we had only two low resolution photos to work from, and both are from the same angle. I've finished my entry, but I can think of at least one significant problem with it. So there should be plenty of opportunity for someone to beat me! All the entries so far, are really amazing. If an incorrect piece is used in the place of a correct piece, does this count as 2 errors (one for the use of an incorrect piece and another for the absence of the correct piece)? In other words, is it better to leave the model incomplete, or to make up an incorrect (but feasible) solution? As done in the previous year each wrong part, was counted as one mismatch only. I plan the same for this Challenge issue. I know that, but when does the absence of a correct part count as a mismatch? An empty ldr file can't count as 0 mismatches. always when a part is not where it is expected to be. I think this generic enough to guaranty that no one wins the contest, simply because he sent an empty .ldr file. In that extreme situation all parts are absent and should count as mismatches accordingly (in the same amount of the set parts number). - it would count as a mismatch if the right part, with the right color is at the "right" place, but with a different orientation or an offset. Typical misplacements. - meaningful offsets are cases where parts should count as a mismatch. However if one part is missing at one place, but appears at some other place where it should not be and without any obvious relation, that it should count as two mismatches. One for the missing event, and another for the meaningless placement. Hope it makes a clear explanation. well, in fact Eric linked his render here (into the comments) in first instance. I noticed he took care to show exactly the same perspective that's on the images available, to avoid showing further details. Didn't notice on the underside reflection detail and guess Eric didn't thought about that too. I could remove the link in the comments here, but since it is posted at EB... I can do nothing there. Only if Eric removes the image on the source. I'll let him know. After all I can say the same as I said for the other images online, one day before the contest to start. Can't blame anyone of course. Everyone should try his own guess, otherwise maybe copying mistakes from others, giving away their chances. And I can tell there are mistakes around! But of course there are here several things I can't control. It seems that this competition is really on. I've seen that the views of my own made 8066 set are going up. To bad I can't participate in this competition, because I can't figher out how LM-CAD works. I first need some practice with this program. Because I want to tribute to the challenge, is it posible to sent photo's of my based set? Of couse I won't participate in the challenge, but would like to know what Conchas thinks about my view on the 8066. Just send those you like, and I'll find one way to cover them in the post to come, about the models submitted into contest. Your MLCad looks Ok, and the problem doesn't seem to be there! Indeed it seems the file you opened ('Untitled.ldr'), is empty. Something went wrong with the conversion definitely. But to bee honest haven't seen yet one that worked 100%. Thanks for your reply. I'll sent you the photos this weekend. I hope you can fix the problem. I would be a shame to see all your work go to wast. For the difficulty level required by the model in this contest, I think I could say MLCad is as easy as LDD (or almost). You just need to practice MLCad a bit, as you have practiced LDD, to learn how to use it. I'll try to practise with MLCad tomorrow, and I'll read "Ldraw tutorial - part 2"
Don't know which LDD version are you using. But I've LDD 4 and there, for what you want to do, you could not use 'Save' or 'Save As...' (and change file extension to .ldr), but instead you must use 'Export model' and select 'LDraw-Files (*.ldr)'. Please notice the notes just added to the end of this post. They relate with the need to use the latest LDraw Library updates available, in order to guaranty that you won't incur into unvolunteer mismatches. Where you will also find instructions on where to place it. It works now. I just have to replace the wheels, panels, and some other small things. There's 1 part that is visible but I don't know what it is, and I think it's really hard to get parts at the right angle, but I hope I can send my entry in tomorrow. Does anyone know how to turn an L3B file, from SR3D of course, into the appropriate file type. I believe I need to turn into a LDR file am I correct? I might be able to open it in MLCAD..
You can open an .ldr into SR3D, but don't think you can open a .l3b into MLCad, neither export to .ldr from SR3D. I have just sent you my entry in the form of an ldr file. Anyways.. It turns out that you CAN open a .L3B into Mlcad but not into BrickSmith.. It is also possible to open an .ldr file in SR3D, Mlcad, and BrickSmith but not possible to save/ export as .ldr through SR3D.. I opened my .l3b file in MLCAD to save it as an .ldr.. I checked the parts count and it turns out that they have an equal number of parts so I assume the transfer worked.. Then I opened the .ldr in SR3D and in BrickSmith to further check. Bricksmith could not find several parts but SR3D was able to open it without problem. From there I took a picture with LDVIEW and used that as my model's image..
OK, a few things. Yes, I did intentionally match the angle of my render to the picture of 8066 to not give anything away. The version of the render that I linked from this page has no background and no reflection. However, I also made another render with a reflective floor. I didn't send anyone the link to that one, but I did post it on my Brickshelf account, so I guess it not surprising that someone found it. I have already stated that I KNOW there are problems with my model, so we'll see how many people copy them! Yes, you can easily open an SR3D file in either MLCAD or Bricksmith. The format is the same. The first thing you do is just change the file extension from L3B to ldr. Then open up the file in the text editor and add a new line at the start which has just a "0". MLCAD and Bricksmith need a "header" row at the start and "0" is a comment which works for this. SR3D just starts right in with data on the first row which confuses MLCAD. So for you SR3D people, just save the file, change to .ldr, and add a 0 at the beginning. Conchas should then be able to read it fine. I'm done :D I hope I didn't make any big mistakes with Mlcad. I saw at least one thing in Blakbird's and another thing in Barman's picture of which I thought it was wrong, so I made it from the 2 pictures on this site.